The vsp gene was fine mapped to a 353.7-kb region, and a 201-bp deletion that affected chloroplast development and chlorophyll biosynthesis was found in the candidate gene GhPUR4. Virescent mutations can be used as marker traits in heterosis breeding and can also be used to research chloroplast development, chlorophyll biosynthesis and photosynthesis mechanisms. Here, we obtained a light-sensitive virescent mutant, vsp, that has reduced chlorophyll (Chl) content and abnormal chloroplast development. Then, the virescent space (vsp) gene in the vsp mutant was preliminarily mapped to a 38.32-Mb region of chromosome D04 using a high-density SNP genetic map with a total length of 5384.33 cM and 4472 bin markers. Furthermore, the vsp gene was narrowed down to a 353.7-kb region that contains 15 candidate genes using 484 virescent individuals from an F2 population. Sequence analysis of genes in this region showed that a 201-bp deletion was present in the Gh_D04G1108 (GhPUR4) gene in the vsp mutant. The 201-bp deletion of Gh_D04G1108 caused the deletion of 67 AAs in the GhPUR4 protein. 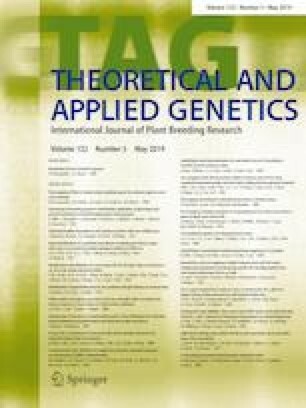 Virus-induced gene silencing (VIGS) of GhPUR4 in normal plants caused reduced GhPUR4 gene expression levels, reduced Chl content, abnormal chloroplast development and virescent true leaves. This study could help us unravel the function of GhPUR4 in chloroplast development and Chl biosynthesis at the early developmental stages of the true leaves in cotton, which could promote the research and application of virescent mutations in cotton heterosis breeding. The online version of this article ( https://doi.org/10.1007/s00122-019-03338-9) contains supplementary material, which is available to authorized users. This research was funded by the National Key Research and Development Programme of China (Grant number 2016YFD0101400).